Greg Rusedski has been an Arsenal fan since around 1996. (CNN) -- They may be famous, but even the world's biggest names go weak at the knees for their favorite football team. 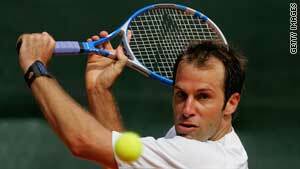 Football Fanzone talks to former British tennis number one Greg Rusedski about his long love affair with Arsenal. Where does your love of Arsenal come from? I think it is just from when I first came over to Britain to represent the country to play. I met a lot of the Arsenal players, and all of my wife's family and cousins and friends are all Arsenal supporters, so there is only one team to support! What is your most memorable moment as an Arsenal fan? I think it is the undefeated season where they won the Premiership and they didn't lose one match and were called "The Invincibles." That season was obviously the best season of Arsenal football ever. When was your first Arsenal match? Ian Wright invited me to a game because he quite enjoys tennis. So he invited me to come down to watch the boys play at Highbury. It was the match against Coventry, I think it was '96 and it was the first game I went to, and Wrighty scored one goal in that game. It was a great game because you just sat in the North Stand where all the family and friends sit, and it was a brilliant day out. Arsenal have had some great players down the years. Who was your favorite? That's a really, really difficult question, actually. I think there is a lot. I think at the moment, Cesc Fabregas for me is the man for Arsenal, but if you go back in the past history, Thierry Henry was amazing for the team as well. Wrighty actually had the scoring record until then. So I'd probably say that if we can hold onto Fabregas, I think Fabregas will be my favorite player. Do you think too much responsibility rests on Fabregas' shoulders? Well, I think we need to get more depth in the squad. That is the problem we always have, we are always one injury away from our season not working out the way that we would like. And it is too often that you try to get bargains and things done without having two sides, because if you look at Chelsea and Manchester United, all the big teams at the moment that are dominating the Premiership and winning the Premiership, they have two teams -- they have 22 solid players so they have two teams that they put on the pitch anytime. While Arsenal, with us right now we need a better keeper and we need more depth within the squad. If we want to challenge with the big two, be in that category and start winning things, that is what we are going to have to do. It can't just be left on one player, but if we don't keep a player like Fabregas then it is not going to bode well for the future. Arsene Wenger: Genius who can stay forever, or too long without a trophy and time to go? No, Wenger should stay. The question with Wenger as a supporter and a fan is that you don't know how much cash he has available to him. That is the only question mark you have. I am assuming that he isn't getting all the funds he would like to get, and that is the only reason why we don't have depth in our squad. That is the only question mark but Wenger should stay, he has turned around the club, he has brought fabulous players in. For us he is the key, if Wenger leaves it would almost be worse than Fabregas leaving. And as an Arsenal fan, which is the team that you almost love to hate? Well, there is only one team that we love to hate. That is almost a non-question, any Arsenal fan will give you the same answer. How is that as a reply? You know who it is [north London rivals Tottenham].